A friend’s mother made this for us on a hot summer night and I found it deliciously light and refreshing. I doubled the sauce in my version as my family loves it. Cook chicken in butter in large skillet until lightly browned (about 8 minutes per side). Mix wine, lemon juice, salt, and dill; pour over chicken after it is browned. 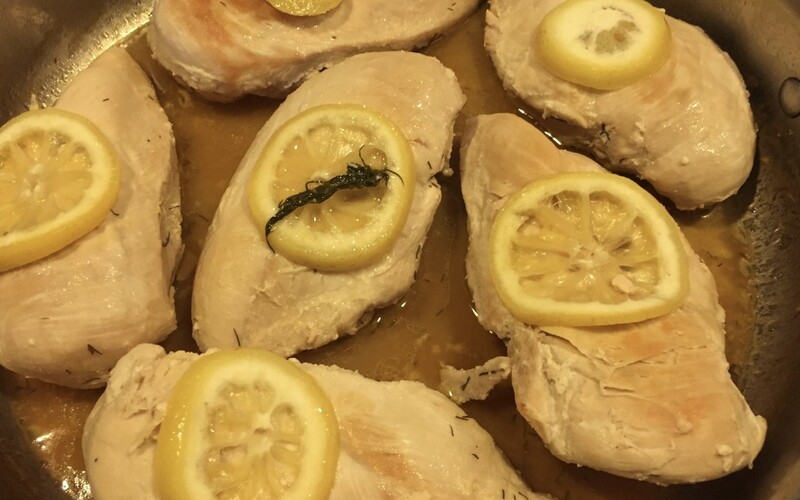 Place lemon slices on chicken. Heat to boiling; reduce heat, cover and simmer chicken until done (about 15 minutes). Remove chicken and keep warm. Heat wine mixture to boiling; cook until reduced to about half (about 3 minutes). Pour sauce over chicken and sprinkle with onions.